Today, we’re launching a new guided API builder for AWS AppSync. Before today, knowing GraphQL was a prerequisite for building an AWS AppSync API because AWS AppSync is powered by GraphQL. GraphQL is a powerful API query language that allows your backend and applications to perform complex data fetching in a single round trip for efficient network operations. The “no-code” GraphQL API builder, which we released in July 2018, was a step in relaxing this requirement. 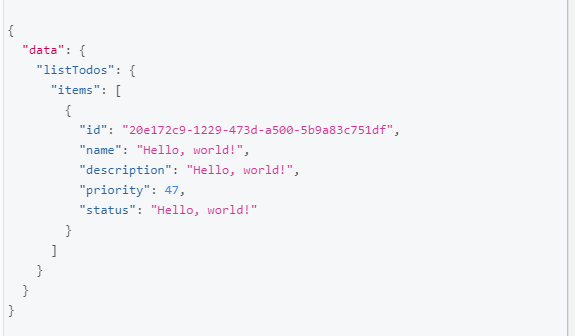 With today’s launch, we’re making it even easier to create a powerful API for your mobile and web apps—without any prior knowledge of GraphQL. The guided API builder enables you to define a data model by using a simple web form. 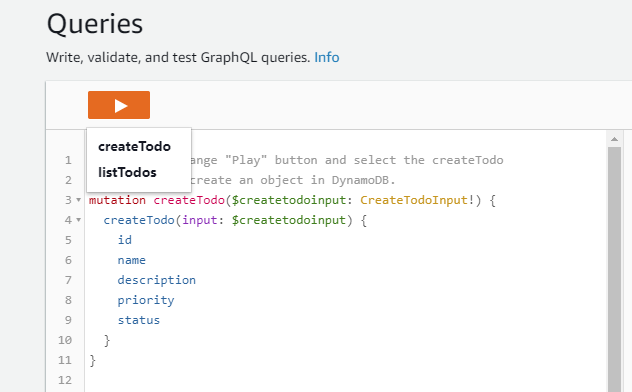 It automatically creates the GraphQL schema, Amazon DynamoDB data table, and resolvers that are required for your app backend. Here are the steps to create a simple app backend using the new guided API builder. Go to the AWS AppSync console and choose Create API. Choose the Start button that corresponds to the Create with wizard option. This screen lets you define the data model that autogenerates the schema, DynamoDB data table, and resolvers. Enter the name of the model as “Todo”. Add the following fields: id of type ID (ensure that the Required checkbox next to it is checked), name of type String, description of type String, priority of type Int, and status of type String. All fields other than id are optional, so don’t check the “Required” attributes for the other fields. This screen allows you to name your AWS AppSync API, and shows configuration parameters (when they’re available). Enter a name for your AWS AppSync API as “Todo App”, and choose Create. That’s all you need to create an API. 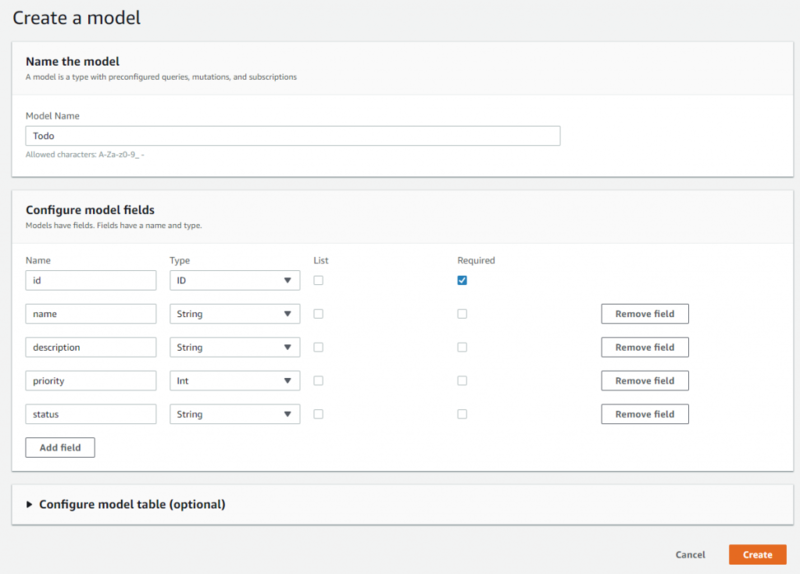 AWS AppSync now does the heavy lifting of creating the required DynamoDB table and resolver for this data model. After the resources are created, you’re automatically taken to the Queries page where you can test your API. On the Queries page, use the pre-generated mutation to enter data for your data model. Then run the query to fetch back the data that you entered using the mutation. You can do this by just pressing the “Play” icon on top of the page, and selecting createTodo from the drop-down. Press the “Play” icon at the top of the page and select the listTodos option from the drop-down. This runs a query to fetch your newly entered data. This is how your data looks when it’s returned from your AWS AppSync API query. You can now navigate to the API dashboard to learn more about integrating your newly created backend with your app frontend. 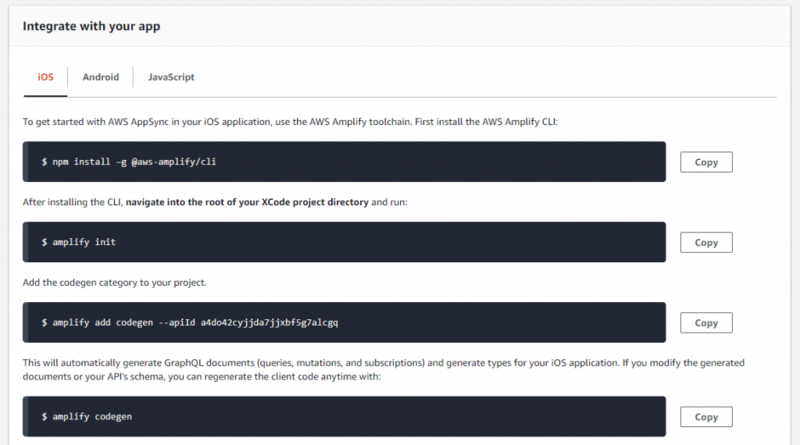 We do this through the recently-launched AWS Amplify CLI. Choose the API name (Todo App in our case) below the APIs option in the left navigation pane, and follow the instructions on the API dashboard under the section Integrate with your app. As always, we’d love to hear from you. Please comment below or reach out to us on the AWS AppSync Forum.